If you love your home and it’s in a great location for schools, transport, work and friends, then renovating it is probably a smart, cost-effective solution. Conversely, if your home’s not great but the location is, you might want to start again. If so, see our “New Homes” section. By sitting down together we’ll be able to ensure that all your needs – even the ones you may not have thought of – are taken into account. This is our chance to get to know each other and the better we do the better the end result will be. If you’ve never been through a home renovation chances are you’ve never applied for Council or Certifier approvals. If not, don’t worry. We’ve been doing so for 16 years and have a 100% success rate. This includes even the most complex projects such as properties on Bushfire Prone Land, Heritage Conservation Areas or Heritage Items. 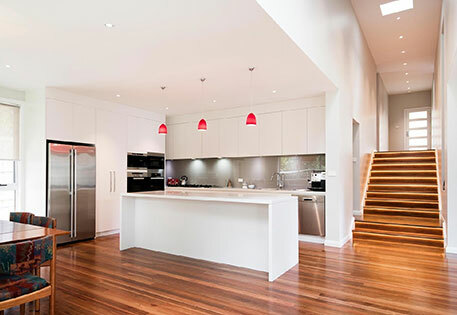 Rest assured, an elegantly simple, creative renovation can provide years more use of a beloved family home in a location you know and love and that’s close to friends and amenities. For more information, please feel free to call us or send us a message.